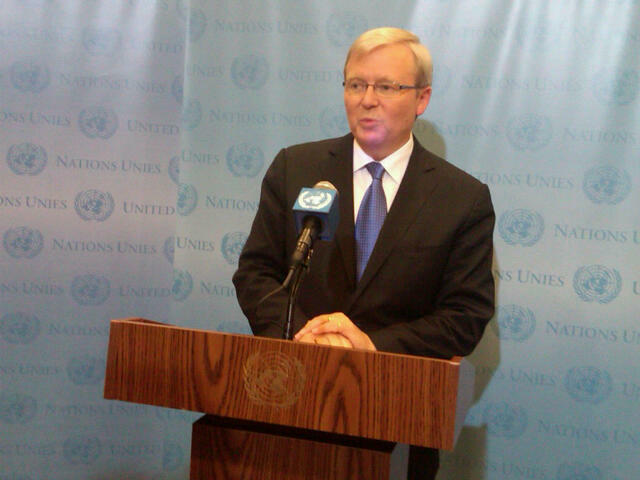 UNITED NATIONS, September 22 -- When Australian Foreign Minister Kevin Rudd finally came to the UN Television stakeout position on Thursday after 9 pm, he was asked about Prime Minister Gillard urging him to spend less as he travels overseas. Rudd replied that while in New York he will stay in the country's residence rather than a hotel, and that he does that in many other places including Washington and London. He said he makes "no apologies" for frequent travel, given for example that he has interlocutors in Jerusalem and Ramallah, Paris and Beijing. What Inner City Press learned while waiting for Rudd to appear, however, is that Australia agreed to pay a "substantial" extra amount to keep the UN TV stakeout open, after the UN General Debate was over for the day. Rudd's stakeout was supposed to be at 6 pm, but no one but the UN TV crew was there. Inner City Press tweeted it, and went to work on a story about Palestine. Then the UN said Rudd would speak at the stakeout at 8:30 pm. This too did not happen. After Rudd spoke in the General Assembly and then that closed, after one more speaker, still Rudd did not appear. A Rudd staffer cited health concerns, his recent heart attack, for the reason. Long time UN hands wondered aloud where Rudd could be, since everything was closed or closing in the UN. There was discussion of Australia having agreed to pay extra for this delay. Perhaps for this too there is no need to make apologies. But perhaps not. Inner City Press asked Rudd about Australia's vote in the General Assembly on a resolution to give Palestine Observer State status (he answered long but without a yes, no or abstain) and about Sri Lanka, which we'll report on separately. Watch this site.